The first thing that comes to mind when we hear the phrase “state sanctioned execution” is the death penalty. There are only five nations in the world that still possess death penalty statues – China, North Korea, Iran, Yemen and the United States. According to Amnesty International, the death penalty does not deter crime, is the least cost effective form of punishment, is racially biased, and too often claims innocent lives. On Good Friday 2017, it is important to recognize that state sanctioned execution is always wrapped in a culture of violence. Culture is comprised of the beliefs, values, arts, morals, laws and tastes of a people, organization, or nation. State sanctioned execution is normal in cultures where violence is commonplace. Indeed, in locales where violence is the norm state sanctioned execution covers a gambit of methods, from lynchings to gas chambers, from vigilantism to electric chairs. Jesus was a victim of state sanctioned execution. Arrested by the Roman authorities at the behest of the Jewish Sanhedrin, he was tried and falsely convicted of treason. So often we rush to tell the rest of the story about his crucifixion and the seven last words he spoke from the cross without pausing to notice that both Rome and the Jewish Sanhedrin, the Roman government and Judaism, possessed cultures of violence in common. Rome was an empire built upon and sustained by the constant blood-letting of warfare and legal fiat. Judaism was so profoundly baptized in blood that God is imaged as saying “To what purpose is the multitude of your sacrifices unto me? saith the Lord: I am full of the burnt offerings of rams, and the fat of fed beasts; and I delight not in the blood of bullocks, or of lambs, or of he goats. And in the New Testament the saying “without the shedding of blood there can be no remission of sin” is inscribed as a sacred text. The very crucifixion of Jesus itself is imaged as God demanding a human sacrifice as an appeasement for the sins of humanity. Fundamentalist Southern Christians in North America who learned to read the Bible literally using the lens of white supremacist ideology, justified and continue to justify the lynching, shooting, electrocuting, and imprisonment of Black, Brown and poor bodies on the basis of culturally violent proclivities and perverse understandings of the ministry and meaning of the Christ. God sent Yeshua into the world so that humanity could see what happens when violence is imitated and internalized and celebrated – when all of that happens and happens repeatedly – even one who bears the express image of God is crucified or hanged or gassed or electrocuted. Tonight, this Good Friday, we will see and hear presentations and reflections on state sanctioned violence through acting, singing and speaking. 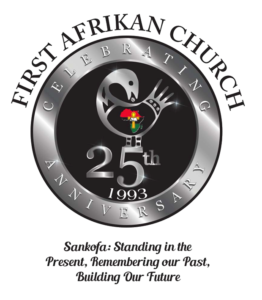 Thanks in advance to the First Afrikan Sanctuary Choir, the Ngoma Lungundu drummers, Dr. and Deacon Shirlene Holmes, sister Sydney Jones, and Reverends Victoria Ferguson and Carlton Johnson.